Crafting With Craig: Valentine's with a touch of love. Valentine's with a touch of love. Morning, so we are roughly 1 month away from Valentines Day. Not that long ago I was making christmas and all of a sudden we are here with valentines. At christmas after a year of debating, I plucked up the courge and bought the Brother Scan N Cut. I was always thinking would I used or would it just sit there. Im not great with computers and thought if I did use it then I'd only use the machine itself. How wrong I was, I love it and I'm flying high playing with it and downloading SVG files on line with no problem atol. I have made this 8x8 card combining Scan N Cut and Stix2 adhesives new valentines range. I downloaded a heartbackground shape online and cut it out using stix2 sparkly red card and matted and layered it onto White hammered card stock. Then onto a 8x8 card base. 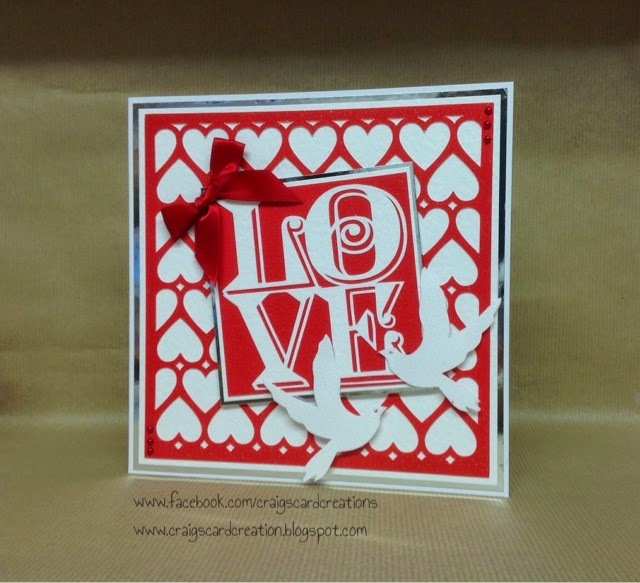 I also downloaded the LOVE shape and cut that out with white hammered card from Papermill direct. Then matted and layered on white hammered card and then onto silver mirri. I added 2 die cut bird shapes, turning one around to face the other way and gave it a slight spray using spray & sparkle to match in with the sparky red background card. Tied a bow using 16mm satin red ribbon and addtached it to the top left hand corner of the love. Added a few red pearls and it's done. Sparkly red card - SGBCA4REDCARD. Die cut bird shape - S57326. White hammed card - Papermill Direct. White super smooth card (insert) - Papemill Direct. Silver mirri card - Anita's. Red pearls - Mei flower. Heart background svg cutting file - online. Love svg cutting file - online. Valentines with the help of Stix2 & PaperMill. Mothers Day Lavender Rose framed gift.